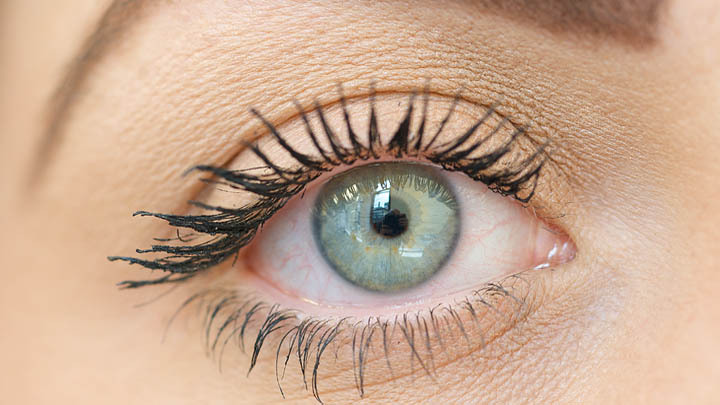 Eyelids and lashes protect the eyes and act as a barrier against foreign bodies. If something comes close to the eye it will trigger a strong, automatic blink reflex. The lashes help to prevent dust and other particles from entering the eye. Tear film spreads a clean layer after every blink maintaining clear, comfortable vision. It sweeps away debris and contains components that aid against infection. Conjunctiva is a clear skin over the white of the eyes (sclera) and the inner eyelids. It seals the eye stopping anything from entering or getting behind the eye. Cornea is a transparent layer in front of the coloured part (iris). It contains lots of nerves that make it very sensitive, so if anything touches this part of the eye, the lids will immediately blink. Sclera is the white outer coat under the conjunctiva. It contains blood vessels and covers the back of the eye too. Iris is the coloured area behind the cornea. The colour is determined by the amount of pigment it contains with blue eyes having very little and brown having the most. Blue-eyed people tend to have fairer skin too and are more likely to have light sensitive eyes as they also have less pigment in the light sensitive layer of the eye. The iris is made of muscle and can change the size of the pupil depending on certain conditions. 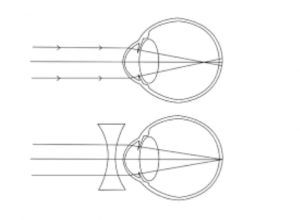 For example the pupil will shrink in bright light conditions to limit the light entering the eye and in poor light conditions the opposite should occur. Pupil is the black centre of the iris and is, in fact, a hole that allows light to enter through. Aqueous humour is the clear, thin fluid filling the gap inside the eye between the cornea and the vitreous humour. It is continuously being produced, pumped around this front chamber and drained away. It is produced by the ciliary body located behind the iris and drains out through a system around the outside periphery of the iris, called the trabecular meshwork. It nourishes the cornea, helps to maintain the round shape of the eye and the relative inflow and outflow affects the internal pressure. This intraocular pressure (IOP) may be taken during the eye examination as a screening tool for the eye condition glaucoma. Lens is a transparent, flexible structure directly behind the pupil. It is held in place by lots of fibres attached to the muscles of the ciliary body. Alteration to these muscles will change the shape of the lens allowing light to be focused on the back of the eye. 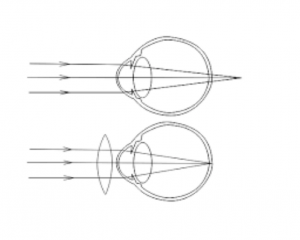 If the muscles tighten the fibres, the lens becomes thin and elongated for distance vision. Alternatively loosened fibres allow the lens to become rounder and to focus for near vision, a process called accommodation. Cataracts is a condition where the lens loses its transparency. Vitreous humour is a firm, jelly like substance that fills the main body of the eye behind the lens. It is filled with collagen strands that move around with eye movement. Retina is the light sensitive part of the eye where the optics of the eye focus the light to trigger an image. It consists of millions of receptors known as rods and cones that send messages to the brain via the optic nerve. The cones are highly concentrated in the central region of the retina, called the macula, and are responsible for seeing colour and detail. The rods are spread across the peripheral retina and perform in low light conditions. Choroid lies between the inner retina and the outer sclera. It contains blood vessels that sustain the back of the eye and the ciliary body. Optic nerve transmits the signals from the eye to the brain. The place where the nerve enters the eye is called the optic disc and as this small area does not contain any rods or cones it is responsible for the ‘blind spot’. There are six muscles attached to the eyeball allowing it to move in different directions. These extra-ocular muscles work together to co-ordinate the eye movements. There are nerves controlling each of the muscles and if any of these falter, it can lead to double vision. Myopia, also known as short-sightedness, is a common eye problem where close vision is usually clear but distance vision is blurred. It affects more than 20% of the population in developed countries and is easy to correct with glasses or contact lenses. Myopia is one of the easiest prescription types to spot with signs such as ‘screwing the eyes up’ in an attempt to read things on the TV or having difficulty reading the board in school. Myopia usually starts to develop in childhood around 8-12 years of age and there is a higher chance of getting it if one, or both, parents have it. Hypermetropia, also known as long-sightedness, is more likely to cause problems with near vision. Most babies are born with hypermetropia but the majority will grow out of it by the teenage years. When we look at close objects the lens in our eyes changes shape allowing us to focus. With hypermetropia the lens has to work harder to focus on close objects and this can lead to tired eyes, headaches and blurred vision. The condition is more noticeable with age because the lens naturally loses elasticity and is less able to change shape. Prescription glasses and contact lenses will correct the vision and ease any symptoms. 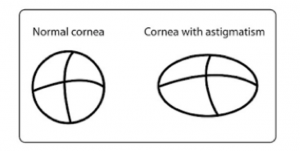 Astigmatism, despite the serious sounding name, is a common and usually minor eye condition. Around 95% of people with a spectacle prescription will have some correction for astigmatism. It occurs when the cornea and, or, the lens is an irregular shape – more rugby ball shaped than football shaped. Significant amounts of astigmatism can cause eyestrain, headaches and blurred vision at all distances. It is easily corrected with glasses and in most cases with contact lenses. Presbyopia is sometimes called age-related long-sightedness and occurs because the eye lens loses its elasticity as we get older. It is less able to focus on close objects and this usually becomes noticeable around the age of 40 and is easily corrected by glasses and in many cases contact lenses. If glasses have not been worn previously then reading lenses are required. These will only be suitable for near tasks and will, in fact, blur the distance vision. For those who currently wear glasses or contact lenses, different prescriptions are required for tasks performed at different distances. This can cause confusion but luckily there are several solutions available including separate pairs, bifocals and varifocals.